Glory has five children and a younger sister, all of whom are dependent on her income from the business. 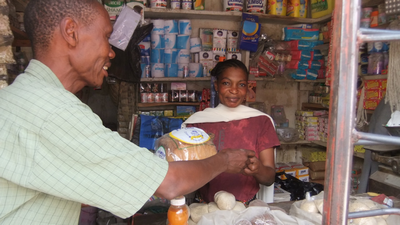 She started with a small grant in 2011 and has managed to extend her business into a proper retail shop, selling a wide range of household food and goods. Helped by her brother, Everest, she manages to make sufficient money to send her three eldest children to secondary school and hopes that the eldest will go on to university. Glory’s success has meant that she is sometimes used by the local Mondo team to provide specific training for new recipients. If you would like to help support more women like Glory, we are currently raising funds for our next round of grants and loans. To help us achieve our target you can donate here.